Researchers know that more, and more dangerous, storms have begun to occur as the climate warms. A team of scientists has reported an underlying explanation, using meteorological satellite data gathered over a 35-year period. The examination of the movement and interaction of mechanical energies across the atmosphere, published Jan. 24 in the journal Nature Communications, is the first to explore long-term variations of the Lorenz energy cycle – a complex formula used to describe the interaction between potential and kinetic energy in the atmosphere – and offers a new perspective on what is happening with global warming. In this case, increased efficiency isn’t a good thing. It suggests more potential energy is being converted to kinetic energy – energy that is driving atmospheric movement – resulting in a greater potential for destructive storms in regions where the conversion takes place. In addition to Li, researchers involved in the work include Yefeng Pan, first author and a former doctoral student at UH; Xun Jiang, associate professor of earth and atmospheric sciences at UH; Gan Li, Wentao Zhang and Xinyue Wang, all of Guilin University of Electronic Technology; and Andrew P. Ingersoll of the California Institute of Technology. The researchers used three independent meteorological datasets to track variables including three-dimensional wind field, geopotential-height field and temperature field at points across the globe from 1979 to 2013. 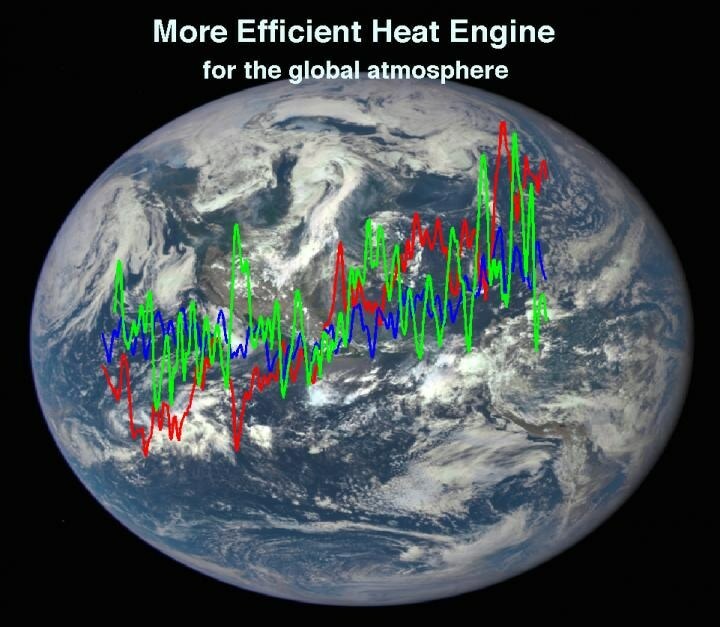 They then used the data to compute the Lorenz energy cycle of the global atmosphere. Such an energy cycle in the atmosphere significantly influences weather and climate. Previous studies have covered only five-year and 10-year periods before 1973, Li said. “Now we can investigate the Lorenz energy cycle of the global atmosphere during the past 35 years, using satellite-based observations,” he said. While the researchers reported that the total mechanical energy of the global atmosphere remains constant over time, there has been a significant increase in what they describe as “eddy energies,” or the energies associated with storms, eddies and turbulence. Li said the positive trends for eddy energies were especially pronounced in the southern hemisphere and over parts of Asia, and the researchers point out that intensifying storm activity over the southern oceans and increasing drought in Central Asia contribute to the positive trends. “This is a new perspective to explain global warming from an energy standpoint,” he said.